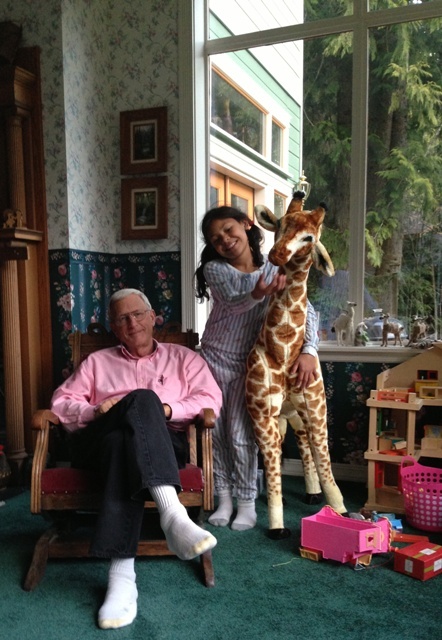 Quilts, dolls, kids, travel, books, recipes, and family life, eventually you will see it all. Today is Memorial Day, the day to honor those who have defended our country. I cannot agree with all of the things our government has done since I have been old enough to vote but still I am grateful to be where I live without fear and I am very grateful to those men and women who fought to create our country and to those who continue to keep it free. 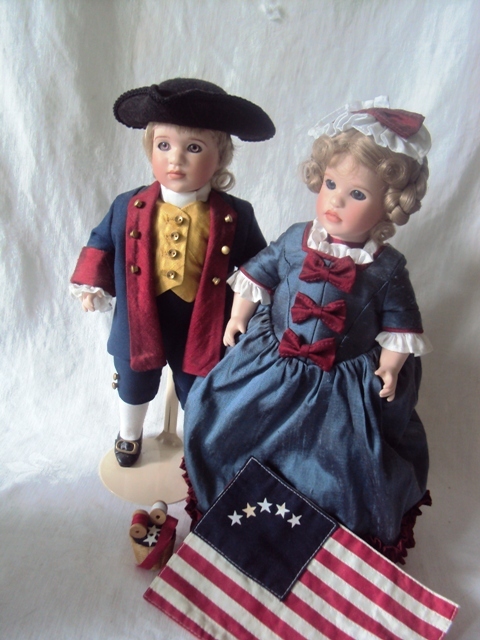 To celebrate I have created a tribute in patriotic dolls. The first represents a soldier from Desert Storm. Created by Madame Alexander. Note that that this soldier is both a woman and African American. Freedom for women and African Americans has certainly increased in my life time. Go little soldier! Betsy Ross is given credit for creating the symbol of our country, the flag. 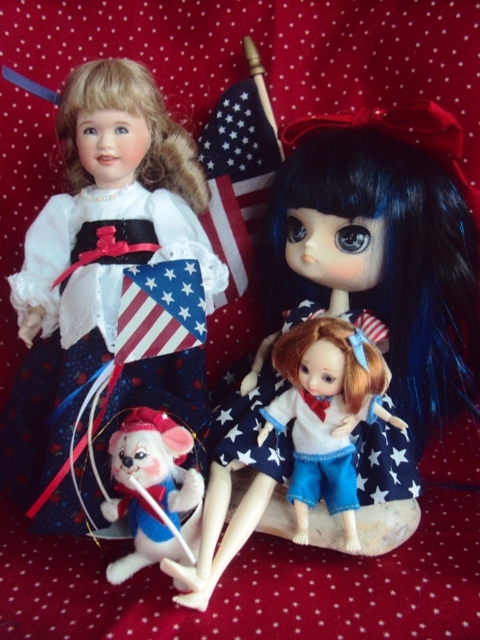 These dolls, Betsy and her friend The Patriot were created by Wendy Lawton. 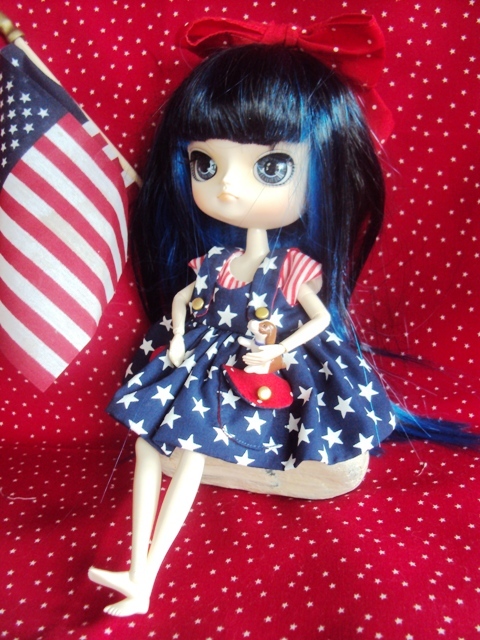 Patriotic Zaundria is a more modern girl, a BJD or ball jointed doll, she can be posed in many positions and here is wearing a dress originally designed for Ginny. 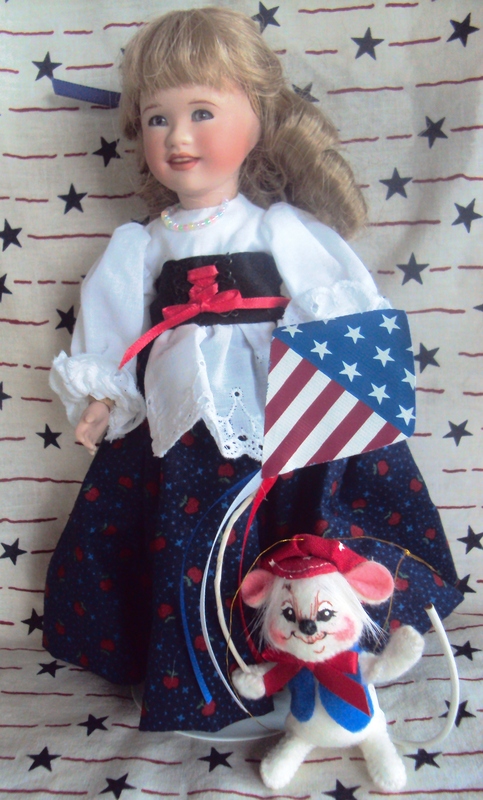 Joy, who is my favorite doll, is wearing the red, white and blue but the style of the “old world.” For this photo she is pictured with her friend the Annalee mouse. 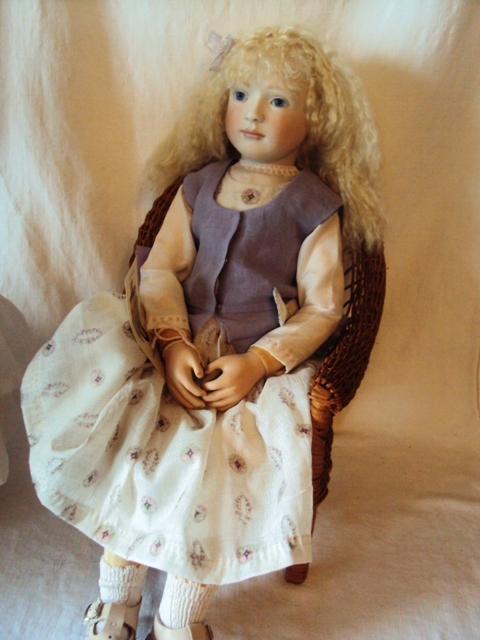 Another Wendy Lawton doll. Red Riding Hood is not a doll that would be thought of as being “patriotic” but this version in red, white and blue was given to me by Ted for my last birthday, she begged to be included in this collection of photos. She is from Madame Alexander. 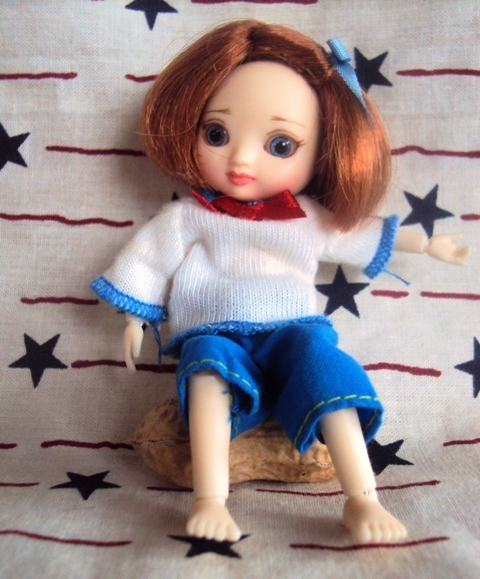 Amelia is the latest addition to my doll collection, just four inches tall, she is sitting on a peanut. She wears tiny clothing originally made for a doll in the Barbie doll family. Amelia, 4 inches tall, sits on a peanut. 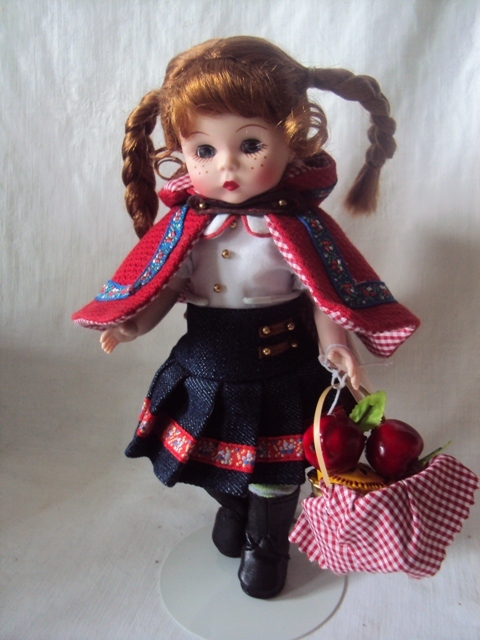 Dolls are more than a hobby for me, I have a doll shop which is now on-line only. 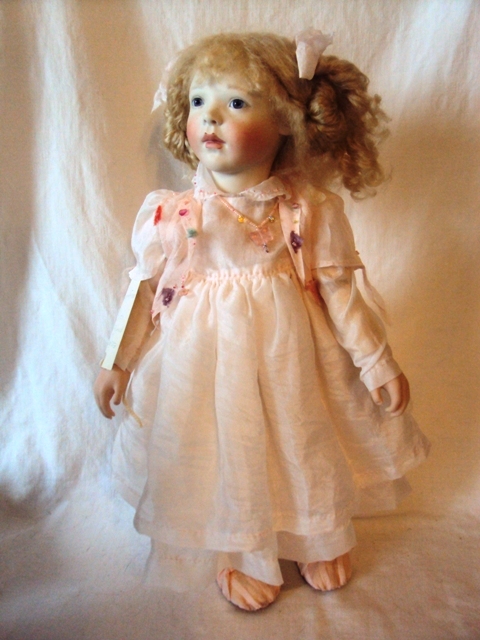 To see other lovely dolls go to Apple Tree Dolls & Bears or dollsnbears.com. Yesterday Ted and I watched the movie “Lincoln” with our kids who are 8 and 11. They seemed to understand the story of the Emancipation Proclamation. It gave us a good opportunity to discuss the evolution of “freedom.” It shows what people were willing to sacrifice for their country and why change needed to happen. We have had more than a half inch of gentle rain so far this weekend. Playing with dolls and watching movies is not a bad way to spend a holiday, with some time left for quilting of course!! 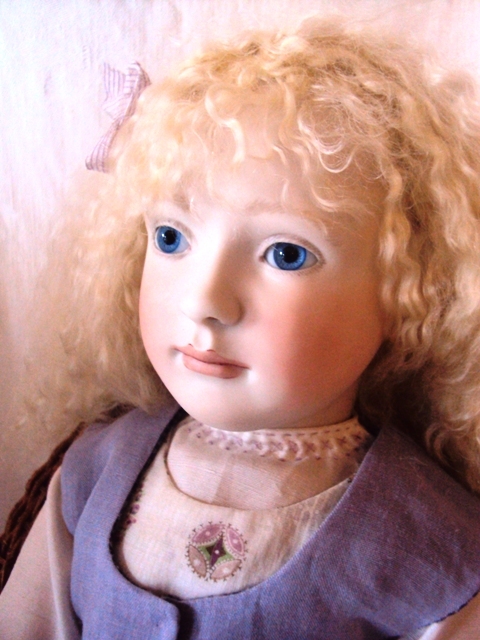 Today I have been photographing dolls for my doll store web site. Some are new dolls and some are dolls that are being moved from the old web site to the new one. I love having contact with the dolls, posing them and trying to get them in the best light. They are dressed so nicely with their hair perfectly arranged. They never fuss or argue or make a mess. Here are some of my favorites from this morning. These two are creations of Wendy Lawton, from California. Wendy has created many dolls over the years and she took heads, wigs and clothing from 100 of them, mixed them up and created 100 one-of-a-kind dolls. 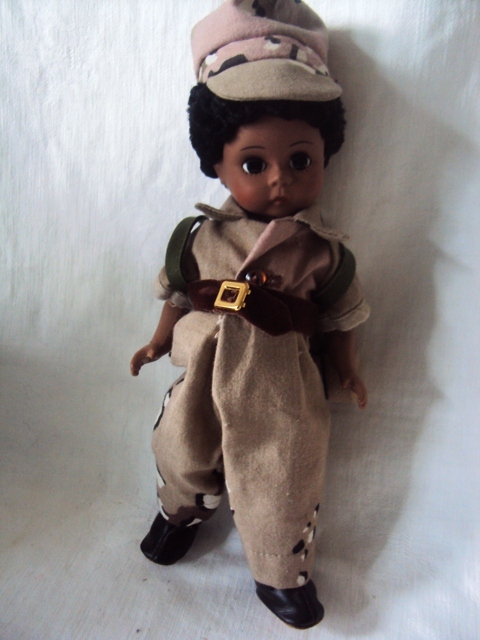 The dolls are 9 inches tall with detailed clothing and beautiful wigs. These two are by Lynne and Michael Roche of England. She sculpts the heads and works with the clothing while he creates wooden jointed bodies for each doll. Again, the clothing is detailed and charming. 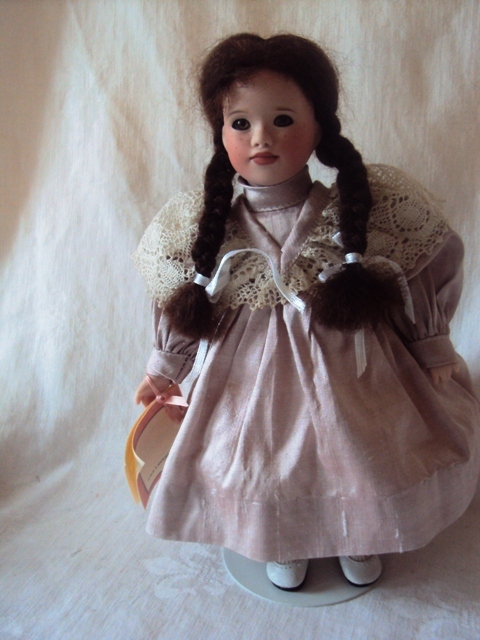 This doll is more of a play doll. 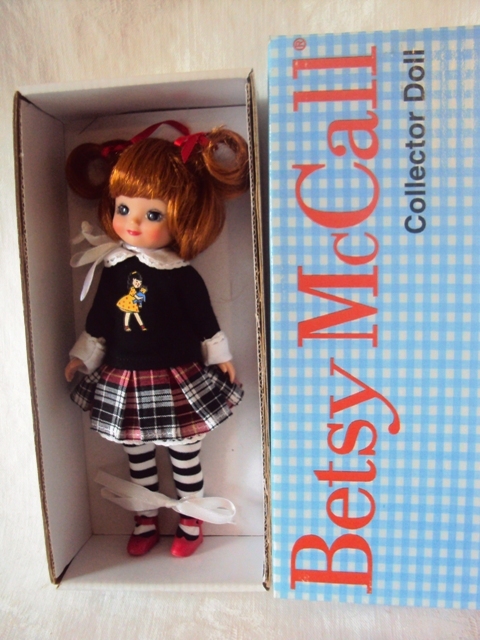 She is Betsy McCall, after the paperdoll that appeared in the McCall’s magazine when I was little. Betsy is vinyl and is also jointed. She is about 8 inches tall. 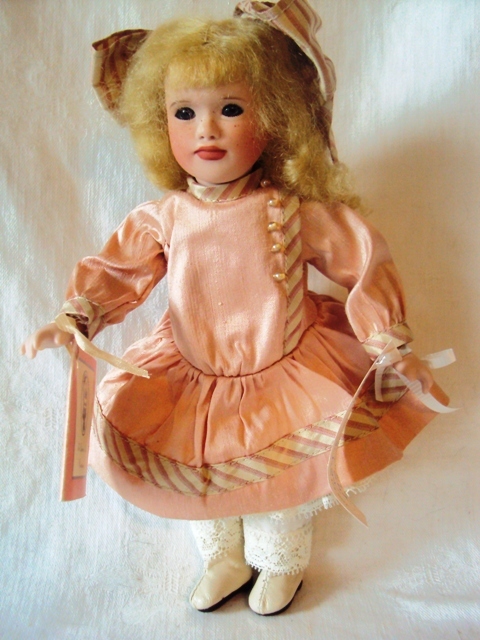 I have loved dolls all of my life. My parents were in the toy business and I sold dolls and toys while in high school and college. It was a natural for Ted and me to develop a doll business in the 1990s. I miss personal interaction with the customers but get to know many of them through email as they make their selections from our on-line shop. You can the dolls at Apple Tree Dolls and Bears . 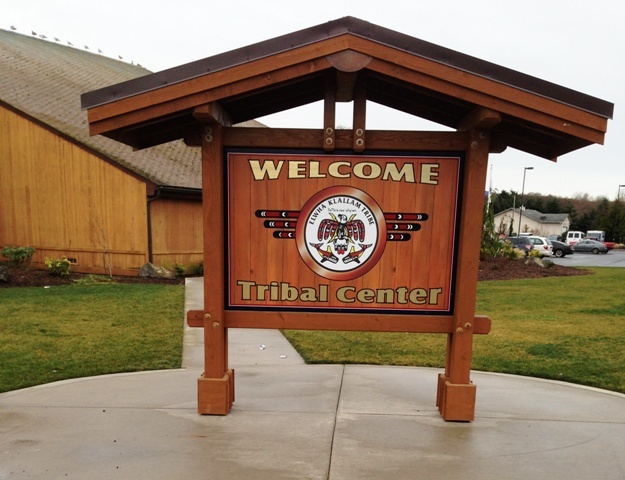 Every year the Lower Elwha Klallam Tribe invites teachers and administrators from the school districts in the area to a dinner and potlatch in the Tribal Center. The food is good, salmon cooked on an open fire, clam chowder, elk stew and a pot luck of salads and desserts. Tables are decorated and everyone is in a festive mood, it is time to thank the school people for their efforts in educating the children of the Tribe. 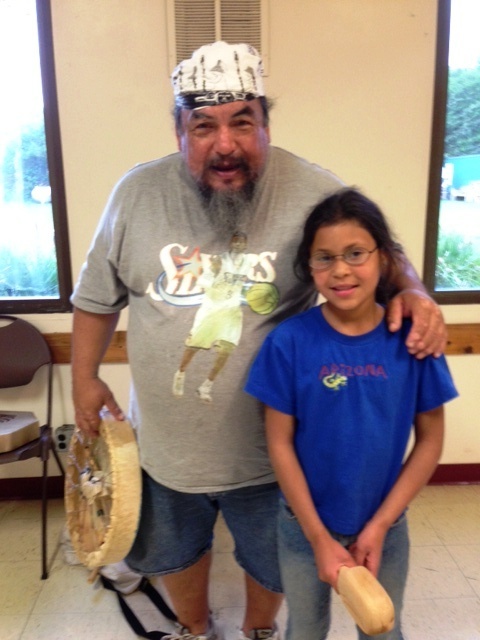 Seneca and Raven have been warmly welcomed into the drumming and dancing group and we always enjoy attending. 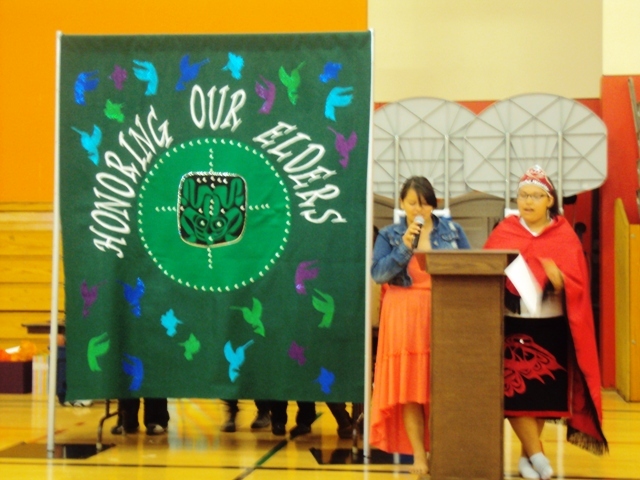 This year the theme was “Honoring our Elders,” and one of the things I admire about that culture is their appreciation of and respect for the older people. The Klallam language was nearly lost because for several generations children were sent away to boarding schools where they were not allowed to speak their tribal language or to learn to read or write it. Finally there were only a few people left who had grown up with the Klallam language being their primary language. 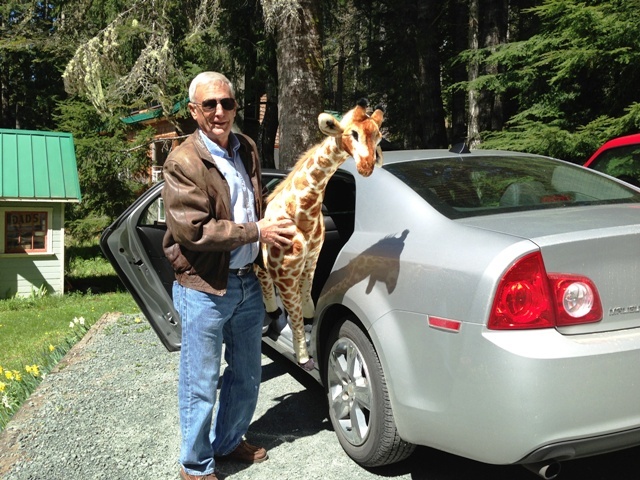 They got together and worked to develop a program for learning and teaching Klallam. 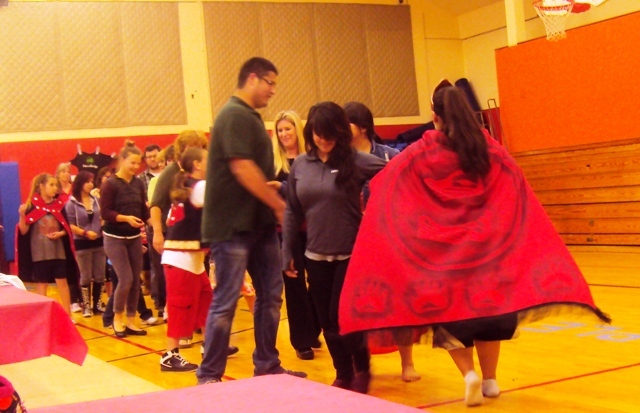 Now Klallam is taught as one of the foreign languages in the Port Angeles high school. A highlight of the Potlatch for me was hearing a young woman read in Klallam a legend of the tribe which she had spent a semester writing. The children always enjoy choosing a teacher as a partner and attempting to teach them one of the native dances. Toward the end the children pass out gifts, many of which they have made, beaded necklaces, key chains, art work and other items are given away. 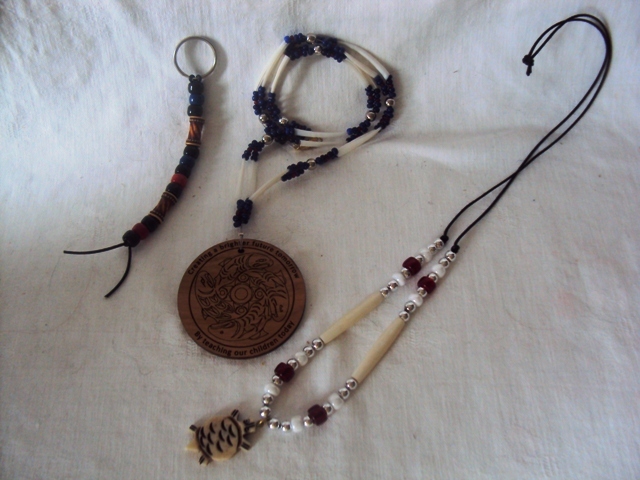 A sample of the gifts the children have made to give to the guests. The final ceremony involves the five “witnesses” who have been singled out as being representative of the people attending. Each is given an opportunity to share his or her perspective on the evening. 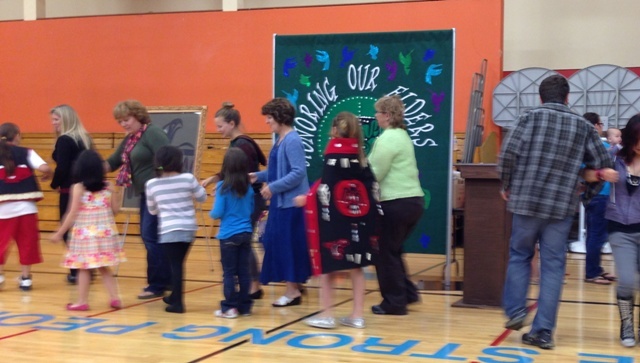 Then each of the witness is “wrapped in a blanket” a traditional way of bestowing honor. 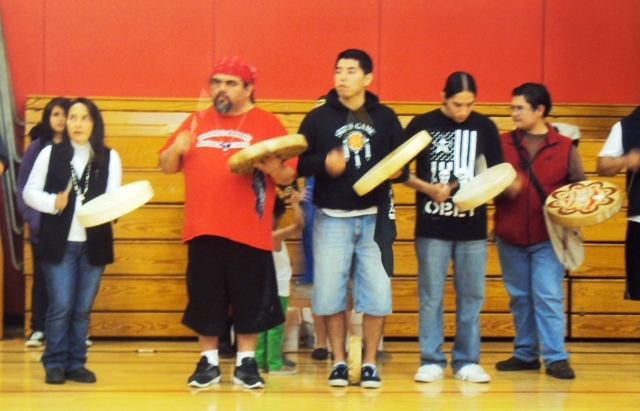 And something very special happened at Klallam Dance and Drum practice a couple of days later. Seneca was called forward and presented with a traditional rattle which had been made by one of the older members of the dance group. He said he wanted to honor her for her hard work and faithful attendance with the group. Seneca is thrilled and there is lots of rattling going on around here. In my last blog I mentioned that Ted had been ill for a few days. Well, he didn’t get better and after two weeks and two visits to the doctor I went with him for the third visit. They sent him to the hospital for a CT scan and could see the problem, they hospitalized him immediately. He began to respond to treatment right away but it was 5 days before he was discharged. The day Ted was admitted to the hospital was the day my brother Jack, who lives in Thailand, was to arrive for his long awaited visit. 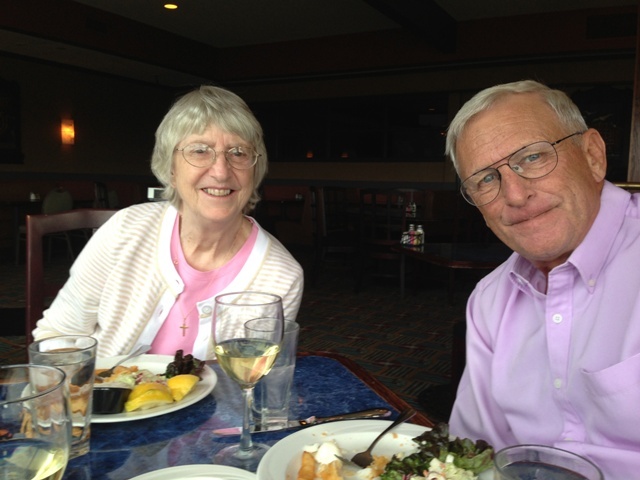 My sister Janie was to join us the next day and we had planned to have some time together, just the three of us. We planned to go out to dinner using an unexpected insurance paymen that came from our parents. It was only about $125 so we had decided to give half of it to Janie’s daughter and her family who are missionaries in Africa, and the other half we would use for our special dinner. Nate, our son, and his wife came to the house to keep an eye on Seneca and Raven so the three of us could relax and chat without interruptions. Thanks Nate! We sat at a waterfront restaurant watching the sun get lower in the sky and talked about the fun things we did as kids. We each ordered fish and chips! They were good too, fresh cod. We stopped by the hospital on the way home to check on Ted, and Janie commented that his hospital room looked bare, I hadn’t noticed, but she was right. 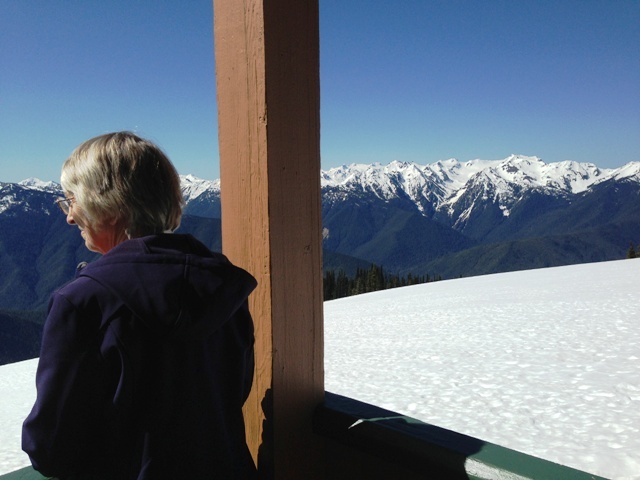 Next morning Janie, Jack and I took a quick trip up to Hurricane Ridge where there is still lots of snow. Incredibly beautiful. 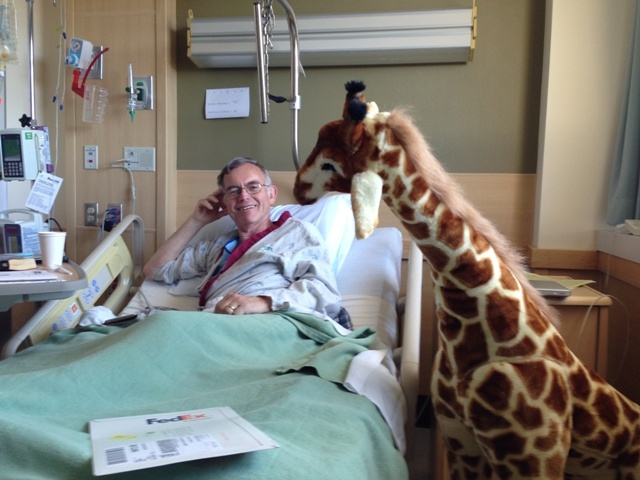 It was Jack’s idea to take the kid’s stuffed giraffe to the hospital to keep Ted company, so we got the giraffe into the car in the afternoon and delivered him. It was Ted’s first real smile in nearly 3 weeks. 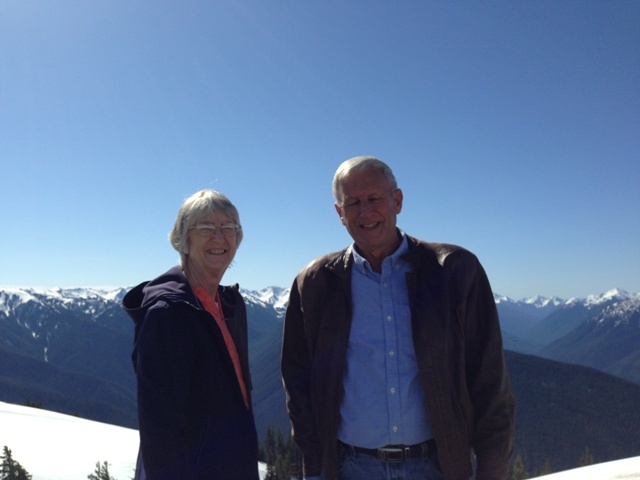 Jack and Janie headed back to Seattle and two days later Ted was discharged, though he will have to return for some surgery in a month or so.